If we distribute or represent a product line, it is because we trust and stand behind the quality and reliability. We are distributors for companies that are industry leaders, and have a long history of good performance and customer satisfaction. We also have a very solid relationship with all of our vendors, which translates to fast, reliable service for our customers. If a distributor or representative of a product does not have a strong relationship with their vendors, then how can they respond effectively to their own customer demands? With Aurora Pumps, our office has been among the top performers in fire pump sales for seven consecutive years, and was awarded Aurora Pump Distributor of the Year for 2006-an honor typically bestowed on distributors who sell in all markets, from HVAC to plumbing, to municipal and industrial product lines. We are particularly proud of this accomplishment, since we are focused on Aurora's fire pump product line. Your requests become our requests on your behalf, and our voice carries a special weight with these vendors in question. We are particularly proud to now be the official representative for another big name in the fire pump industry -- Fairbanks Nijhuis (Formerly Fairbanks Morse). Need a Fairbanks Morse fire pump or fire pump parts? Give us a call! 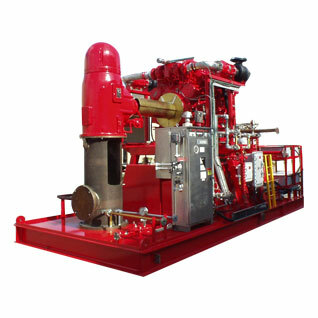 Weir Floway is a world leader in vertical turbine pumps, and we are very fortunate to be associated with their UL/FM fire pump product line. Because vertical turbine pumps are their specialty, they excel at special-metallurgy applications, or suction barrel arrangements. Since vertical turbine pumps are most of what they do, they carry special expertise in this area. Our product lines expand beyond pumps and controls. We also are a representative for the Croker line of sprinkler hose and standpipe equipment, such as hose valves and cabinets. We also represent CST Storage (Formerly Columbian TecTank) for their industry-leading above-ground bolted water storage tank line. Please read on regarding more details about these companies and their products.